It’s been almost two years to the day since we last stepped foot in Gotham for the last installment of the highly acclaimed Arkham series. 2009’s Arkham Asylum is easily a top tier game of this console generation and one of the best super hero games to date. 2011’s Arkham City improved on it in some aspects and left me wanting more in other aspects. That’s essentially how I felt with this year’s installment – Arkham Origins. Arkham Origins tells the story of a much younger, cockier and naïve Batman than we’ve come to know in recent pop culture. For the sake of continuity it’s been said that the events of Origins take place roughly five years before the events of Arkham Aslyum. He’s used to fighting against lowly criminals who are no match for him. That is, until one snowy Christmas eve there’s a large prison break at Blackgate Prison executed by crime lord Black Mask. After thwarting a portion of the jailbreak, Batman learns that Black Mask has hired eight assassins to kill him. Batman will spend the rest of his night attempting to thwart the likes of Black Mask, The Penguin, FireFly, Deathstroke and several others. “I don’t keep tabs on every bloke in this town with a grudge. You’re not popular in this town”. “No one knows Batman. Only heard stories about him, but I don’t believe he’s real”. “The more I learn about The Joker, the more I realize there’s something very different and dangerous about him”. When Rocksteady decided to hand the reigns to another studio (Warner Bros. Montreal) a lot of fans were worried that the team that had showed their beloved Caped Crusader so much love and attention might not live up to their lofty expectations. Well, for the most part the game does a good job of towing the line with previous installments. Gameplay was left largely untouched with little in the way of change or refinement sadly. For the majority of the game, the few combat hiccups I did experience didn’t really hinder my experience much, but during several of the boss fights I was definitely close to throwing my controller at the wall. One of the coolest (and few) refinements that were implemented was a great new crime scene investigator tool. The enhancements allowed you to fast-forward and rewind mock crime scene videos and find more evidence to investigate. It was a little hampered and there weren’t many instances where it was utilized, but that was definitely something I’d love to see added in future games. One of the biggest changes to the game was having to replace Kevin Conroy (Batman in Asylum and City) and Mark Hamill (The Joker in both). Roger Craig Smith did a solid job replacing Conroy, but Troy Baker truly shined as The Joker. Mark Hamill is so iconic as The Joker that it’s hard to imagine anyone ever truly replacing him, but Baker certainly put his all into the character and after seeing him do the amazing Joker monologue, how could you doubt him? We’ve also got a soft sport for both Baker and Smith after interviewing them a few weekends ago at New York Comic Con. The city of Gotham is certainly nice to look at, but feels awfully lifeless. We know it’s Gotham, but only having packs of criminals on the streets seem a little too farfetched. There also seems to be a ridiculous amount of annoying blockages where you should easily be able to grapple to a ledge or rooftop and no matter the vantage point you take you’re unable to get there which can occasionally make navigating the city an unnecessary hassle (I’m looking at you Gotham City bridge). 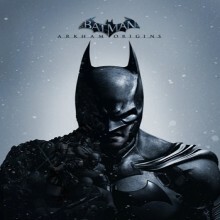 For the most part the graphics are the same as Arkham City, only with a lot more frame tears and random freezing sprees. At first I thought it might be my copy of the game, but after reading through a few various forums it was clear I was not the only one experiencing issues with freezing. While you’ll certainly have a lot to do in Gotham once you’ve finished the eight to ten hour story mode, combating challenges in order to capture the likes of The Penguin, Anarky and Mad Hatter, most of the time it’s just “blow this up” or “beat up these thugs”. They’re fun, but get repetitive pretty quickly. This is the first installment of the series that has multiplayer, it feels more like a poorly made third person shooter and the majority of the time it takes twenty minutes just to get into your first match. I give it points for trying, but so far it’s the worst part about the game by a landslide. It all boils down to the fact that even when something Batman related isn’t as good as another, it’s usually still pretty good. Batman: Arkham Origins is definitely no exception to that. Overall, I was happy with Arkham Origins. It seemed like Warner Bros. Montreal went for a safer approach to Arkham Origins rather than really making it their own, but the outcome was still very good. It’s hard for Origins to step out of the shadows of Arkham Asylum and Arkham City, but Origins is a solid step forward for the franchise. I look forward to what Warner Bros. Montreal and Rocksteady decide to do going forward. Also, if you’re not quite sure what to make of the post-credits scene, here’s a great article from Kotaku explaining what you saw. OBVIOUS SPOILERS.